This spring, I was fortunate enough to be offered a five week residency at Yaddo, an artists’ community and little slice of heaven set onto 400 acres of woods in upper state New York. Built by the Trask family, wealthy financiers with no surviving heirs, it was left to provide time and space to every kind of artist, from writers and composers to visual and performance artists. Yaddo is fiercely private, which helps the community and protects the work while it happens, but an archive does exist at the New York Public Library, where you can learn more about its history. 1. You can work much harder and longer than you think you can. With no distractions and no sense of real life, the whole of your day is for writing and thinking and reading. I often worked 14 hour days and thought nothing of it – until I stood up. Eventually, you have to stand up. 2. The more you sit, the more you need to move – and probably further than the kettle. Yaddo taught me you can run, even if you think you can’t. Surrounded by woods, I was determined to experience them. I used my precious library time to download a running app that promised to get me from “couch to 5K”. I ran in my yoga clothes through the woods as the seasons changed. Snow stood on the ground, melted, became topped up by more falling snow. Suddenly, buds appeared out of nowhere, even as my knees complained. My ankles swelled alarmingly, but after 5 weeks of running around and around the lovely lakes, I found I couldn’t stop. I didn’t want to. I still don’t. 3. If you run alone and work alone, you should also spend some time with humans. Yaddo dinners are communal, taken around a giant table in the dining room of the Trask mansion. You might think you want to be silent – and there is a silent table available – but it is good to remind yourself that you are part of a community. When I arrived, there were 9 of us, with snow still on the ground. When I left, there were 35 and the numbers were still growing. It is good to come together, once a day, with all the others who are working as hard as you are. 4. Sometimes, you will go a little mad. Make room for crazy encounters. Go with the flow. Spin ancient LPs on turntables and say yes to company, to dancing and bourbon, now and again. You know what they say about all work and no play, don’t you? 5. You don’t need internet access for your work, even when you think you do. At Yaddo, the only modems are in the Library and you have to get up and go to it in order to get on line. Limiting access to the internet really does work wonders. In my work space, I could just about get a signal if I stood on a chair and waved my arms. It even made the deer stare. I learned to make notes on what I needed to look up, when I did go to the library, and often found that I didn’t actually need the answer once I got there. It made it that much harder to tweet or email or blog – but it was that much nicer to take a break from all of that. I disappeared for 5 weeks and the world didn’t end. 6. Chipmunks are very small. I thought they were as big as Donald Duck, but they are tiny, much smaller than rats, with beautiful fur that lets them hide on tree trunks. Groundhogs hide on tree trunks, too, though much less successfully. Whenever they see a human, gasping her way down a trail in the woods, they climb the nearest tree and stare at you as if to tell you to hurry up. 7. Even in heaven, the writing is hard. Even in the best study at the best desk with the best working conditions imaginable, the writing will want to play hide-and-seek with you. It is still just you and the page, wherever you are. You have to keep writing anyway. 8. All artists are the same, whatever the practice, whatever the medium. The work is hard for everybody, but advice and solutions can cross disciplines with great ease. Talking with visual artists reminded me that sometimes we don’t know what we’re making, even as we’re making. We have to keep looking from new angles and remember to change tools or approaches if something is stuck. Composers and dancers reminded me about tempo, volume, pace and effect. Poets and photographers reminded me about the specificity of words and the value of observation and wonder. And, of course, the other wonderful writers there reminded me of all the ways a story can be told, all the ways in and through. There is no one way to do anything. 9. Artists support one another. Many evenings at Yaddo, artists share their work by opening studios, reading chapters, showing films or playing compositions. Attendance is not mandatory, Yaddo is quick to say, but most feel that they want to participate, to understand who is there and what they’re doing. Across all disciplines, I had serious and supportive feedback to my work. I hope I was able to offer the same. A community of like minded souls is important, whatever the discipline, and I took away as much from non-writers as I did from poets and novelists. Having someone take your work seriously feeds the work, wherever you are with it. 10. Yaddo is imbued with ghosts: ghosts of four children who didn’t survive to inherit a mansion; ghosts of artists who have lived and worked there; ghosts of artists still living and working, who last worked in the chair you sit in, who stared at the walls as hard as you. They are all still there, at Yaddo, haunting the rooms, living in the pages of the books they leave behind, the Yaddo library filled with Yaddo writers: Sylvia Plath, Ted Hughes, Katherine Anne Porter, Carson McCullers, Truman Capote, Flannery O’Connor, etc. etc. The ghosts of hope and desire and ambition are there, in every house, urging you on. Now, I will be one of their ghosts. My book is there on one of its shelves, living as long as paper can. There are other things I still need to learn. How can I guard my time and my process with the same generosity of spirit that the Corporation of Yaddo does? How can I keep the clarity and focus, even when I’m not on retreat? How can we make room for ghosts in our own homes, so that we can feel a part of this community that existed long before us, that will exist beyond us, all the words and stories and images and thoughts and wants and wishes, so that we will always belong to it, even when we are all alone? Well, I was longer in Yaddo than I’ve been away from it, for another week or so more. I still have plenty of time to learn. My grateful thanks to the Corporation of Yaddo for the gift of time, space, and confidence. I finished my second novel at Yaddo. I can hear the ghosts cheering, even from here. My goodness, this sounds like some sort of heaven. Bit jealous! Now more than a ghost in a machine. Reminds me so much of a place i’ve been too three times in Ireland called the Tyrone Guthrie Centre. A beautiful big haunted mansion with communal dinner for all residents, artists of all kinds. It’s amazing. This Yaddo place sounds fantastic. Were you awarded the residency or did you go as a paying guest? I’ve heard of the Guthrie Centre – sounds a good place to apply! 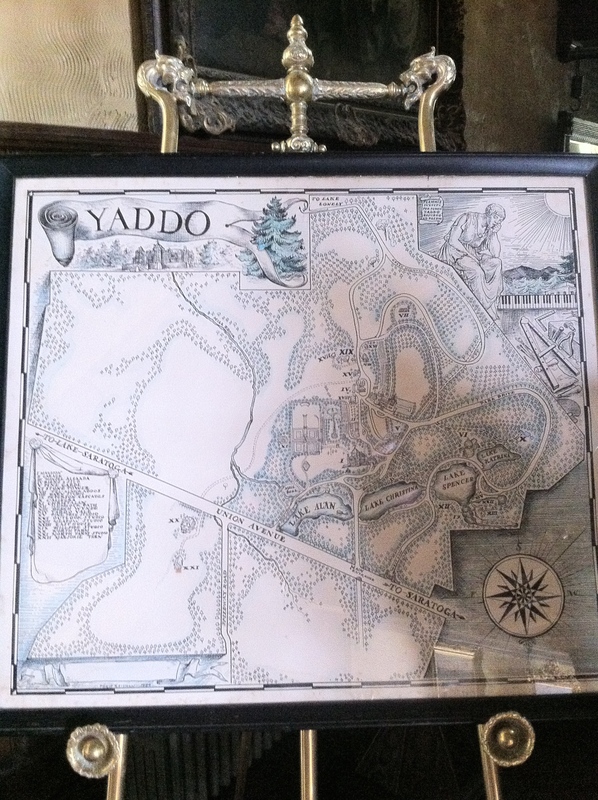 You can’t pay to go to Yaddo, though it would be worth any price. I was chuffed to get a place! What a lovely, inspiring post. Look forward to seeing how you protect your time and process! I, too, was a guest at Yaddo, in my case many years ago. Your experiences sound typical, and I’m glad it was productive for you. I rather doubt, however, that the creature you saw climb a tree when you approached was a groundhog (there’s good reason they’re called groundhogs and not treehogs). I strongly suspect you saw a possum (if it were nighttime I’d include a racoon among the possibilities, but even then I must assume you could recognize a racoon, no? ).